The Fourth of July is almost here, and if you are planning on celebrating this American holiday, you need to remember that your pets need a little extra care if you are bringing them along for the party. 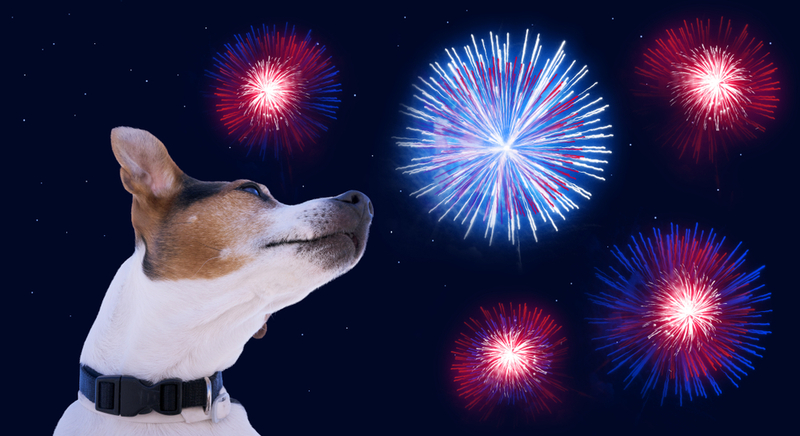 VETMED has a few tips for keeping your dog or cat safe during your Fourth of July celebrations. Loud Noises: Many dogs are scared of loud noises, and not only does this cause them anxiety, but it could also lead your pet to run away or hide. 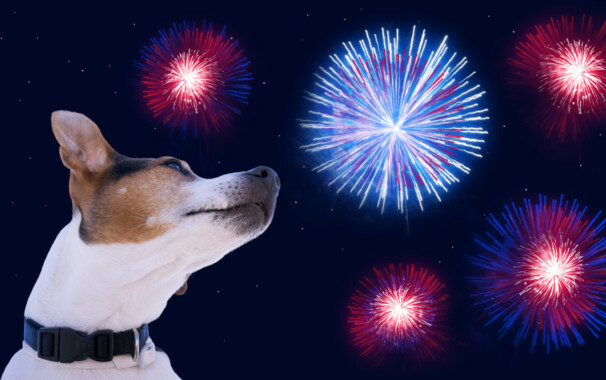 If your pet can hear fireworks from inside your home, you may want to consider putting on soothing music or white noise to help keep them calm. When throwing a party, you can put your dog in a room without access to an outside door to prevent them from slipping out of the house and running away. If you are bringing your dog to an event with you, be sure to keep them on a leash and have a good grip on it in case your dog gets frightened. Don’t leave your dog alone free in your yard or on a lead without supervision while fireworks are going off. Fireworks and Burns: Fireworks put both people and animals at risk for burns. The fire that is needed to set off fireworks can cause serious injuries to your pet, so it is a good idea to keep them away from all fireworks. Don’t allow your dog to chew on or play with fireworks. Chemicals like potassium nitrate, arsenic, and other heavy metals are commonly found in fireworks, and these chemicals are toxic. Alcohol: For adults, Fourth of July celebrations often include alcohol, which can cause weakness, intoxication, depression, coma, respiratory failure, and death for pets. Don’t leave your pet unattended with alcohol nearby, and be sure to place all alcohol out of reach of your pet. Sunscreen and Insect Repellant: The chemicals that are used in sunscreens and insect repellants can be dangerous for our pets. You should never use human products on your pet without permission from your veterinarian. You will also want to make sure you don’t apply these products in close proximity to your pet. Additionally, don’t let your pet lick sunscreen or bug spray off of your skin. When ingested, these chemicals can cause drooling, vomiting, diarrhea, excessive thirst, and lethargy. DEET can also cause neurological problems for our pets. Heatstroke: July is one of the hottest months of the year, so make sure that your dog has access to plenty of shade and water if you are going to bring them out with you for Fourth of July festivities to avoid heatstroke. If you’re going to be outside for a long amount of time you may rub some cool water into your pet’s coat to help them keep from overheating. If your pet gets sick or injured this Fourth of July, VETMED in Phoenix, Arizona, can help. 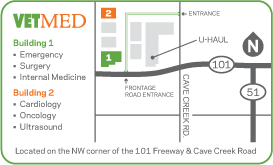 If you are in the area, come by or call our 24-hour clinic at 602-697-4694. 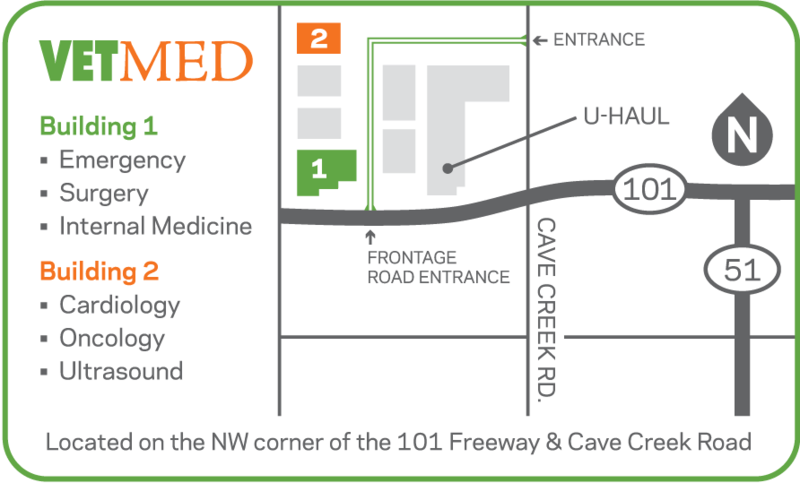 Our emergency clinic is well-equipped to deal with Fourth of July-related emergencies.